The Autograph Man is a deeply funny existential tour around the hollow trappings of modernity: celebrity, cinema, and the ugly triumph of symbol over experience. It offers further proof that Zadie Smith is one of the most staggeringly talented writers of her generation. ?Look for her new book Swing Time , coming November 2016. The first half of this book is fantastic. The second half drags, but has flashes of brilliance. The obssesions of the autograph hunter were magnificent. I will admit that I enjoyed this book more than "White Teeth". If you collect anything this book will resonate with you. Awful. Couldn't finish it. Gave up. Unlikeable characters. I couldn't figure out why I should be investing my time in reading about these dull, self-indulgent people. Clever kabballah themes also not interesting; just clever. Very disappointing after White Teeth, which I really enjoyed. laugh out loud hilarity and witicisms. didn't get the rave reviews of "white teeth", can't imagine why not. After the sheer brilliance of "White Teeth", possibly nothing Smith could have written would have matched up- yet, Autograph Man gives you the impression that she didn't even try. I am sure for all of us there would be a book reading which would feel like we are reading our own life and its happenings; what we think, feel, and live etc. Well, this is my book. Was rather, it depicts a segment of my life almost biographically. I listened to this one in the car. Zadie Smith is one of my favorite contemporary authors, and her storytelling is lush and vivid. 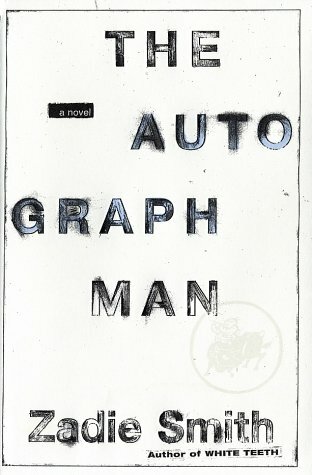 [book:The Autograph Man] was a story about a young man in search of his identity through the stumbling search for religion and an illusive autograph. I started with a certain empathy for Alex as he was forced to do things that neither he nor his family wanted by a dominating partner (been there, got the tee-shirt!) but, as the book progresses, it becomes more and more like a poor British re-write of one of those cosy American sit coms of which Channel Four seem so proud. The problem is, I suspect, that this book falls so neatly amidships of British and American humour that it sinks into the depths of the Atlantic - perhaps that is why the humour is 'deep'! very strange book. i started this in june maybe and finished it in august. what is all this about "the international gesture for ____"? not very likable characters and autograph forging and searching and kitty ? . the subjects below says humourous stories and picaresque literatire! I did not enjoy this book very much. I didn't feel in touch with the characters and it just bored me. It's a shame because I'd really enjoyed White Teeth. I was not particularly expecting very much from this novel, but since we cannot get that many books here in China, and it was a special offer, plus, I thought I should give this author, Zadie Smith, so popular in recent years, a try, I bought this book and gave it a shot. The book comes with some kabbalistic chart, which I could not make sense of, not before, nor while or even after reading. Perhaps it is a kind of postmodern distractor, who knows. Naturally, I was sympathetic to the book opening with a main character of Chinese descent, but, as so often happens the name and background seems too contrived: a English - Chinese Jew, named Alex-Li Tandem. I was willing to go along, but basically, if an author cannot come up with a reasonably acceptable name for the (main) character(s), I must say I soon start losing interest. I never really discovered what the book is about, there does not seem to be a plot or story to follow. I suppose the postmodern author will scowl at me for that. Started strongly, but by the end I found it kind of trite. Not the same caliber as White Teeth, but by no means dull. Zadie Smith writes in a creative way and is able to put to words thoughts that readers don't realize they ever have until they've read the words for themselves. The plot was interesting, but split in several places. This isn't necessarily a good thing, but in the end it left a few ends not quite finished. I found that I wasn't at all pleased with the ending relating the main character and the movie star he idolizes throughout the book. I felt there should have been more of a conclusion there than what exists. I have enjoyed the book to some extent, but then it kept moving in same circles and I lost interest. It simply did work for me. I worship at the alter of Zadie Smith. This was the first of her works that I read, so I didn't come to it with White Teeth expectations, as many others on here did. But even if I had, I don't think I would have felt any differently. It's phenomenal. Gave up at page 133. This is beautifully written, but it is aimless and boring and there are no female characters.